Some may recognize her for her stellar performance at Class Day, racking up scholarship after scholarship, while others know her for her infectious smile and unmatched work ethic, but no matter the circumstance, it is evident that Jailyn Smith is one of the Class of 2018’s most exceptional students. In her years at RJR, Smith has maintained an overflowing list of leadership positions, and I literally mean overflowing, as her resume took up an entire page of notes on my iPhone. So take a deep breath, because here they come. 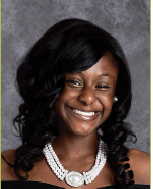 She was on JV and Varsity Cheer, Co-President of Senior Council, a Co-CEO of Curls for Girls, participant in Young Ladies of Virtue, founded the Student Advisory Council at the Career Center with the help of Dr. Nichols, and was the 2017-2018 District 5 President of HOSA-Future Health Professionals to top it all off. Are you impressed? So was the selection committee of the Cheatham-White Scholarship at North Carolina Central University. In its inaugural year, the scholarship awarded nine outstanding students out of 200 applicants, making Smith’s accomplishment all the more admirable, considering an acceptance rate of 4.5%. Despite her outstanding achievement, Smith acknowledges that her great success did not come without overcoming substantial obstacles. Jailyn also added an emphatic shoutout to her mother and her favorite counselor. “She is my biggest supporter and I love her dearly,” Smith gushed in regards to her mother. “Also, shoutout to Ms. Cristen Wiley for nominating me for the Cheatham-White Scholarship!” (The following quote should probably read as a impassioned declaration considering she texted them to me in all caps). As her high school years come to a close, she offered a poignant word of advice for those who come behind her.